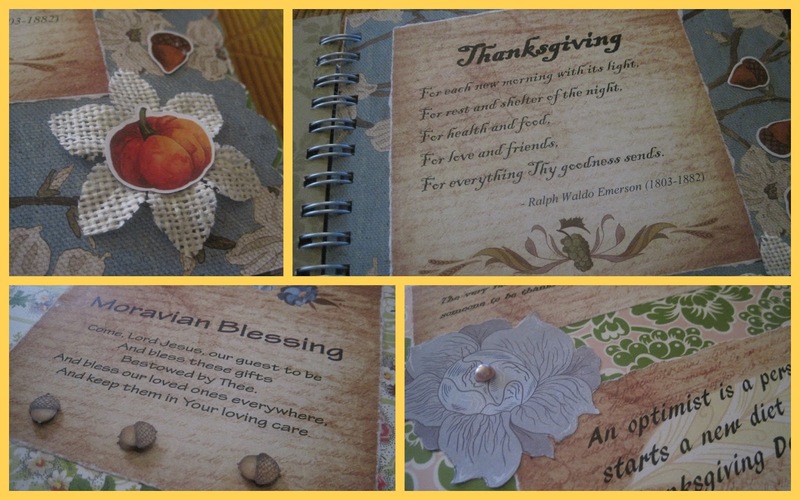 This week a friend of mine had a big birthday and I made her an inspiration book filled with Bible scriptures and prayers related to Thanksgiving! 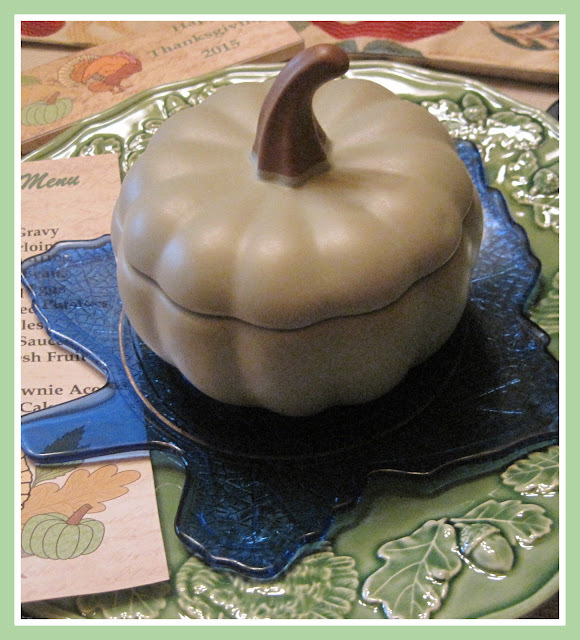 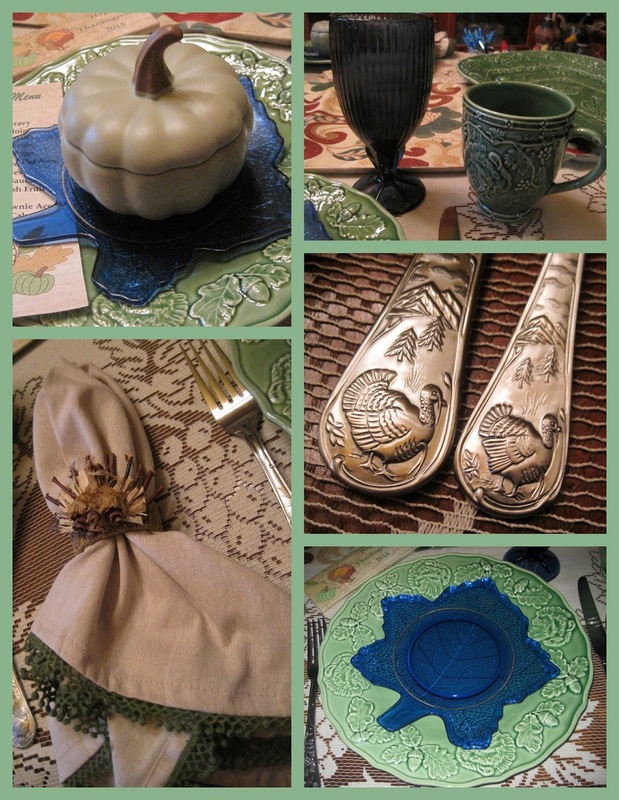 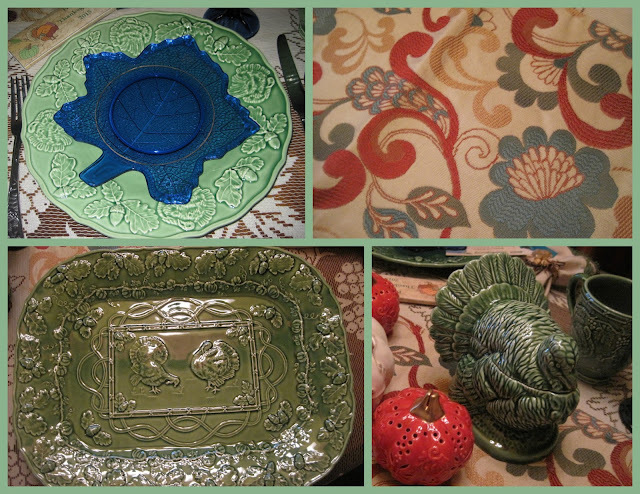 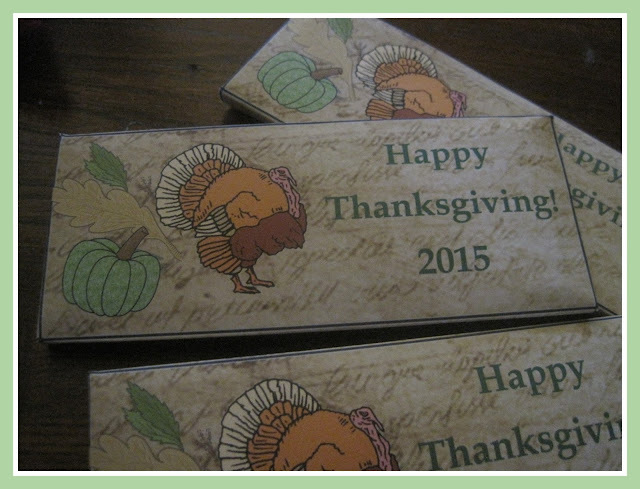 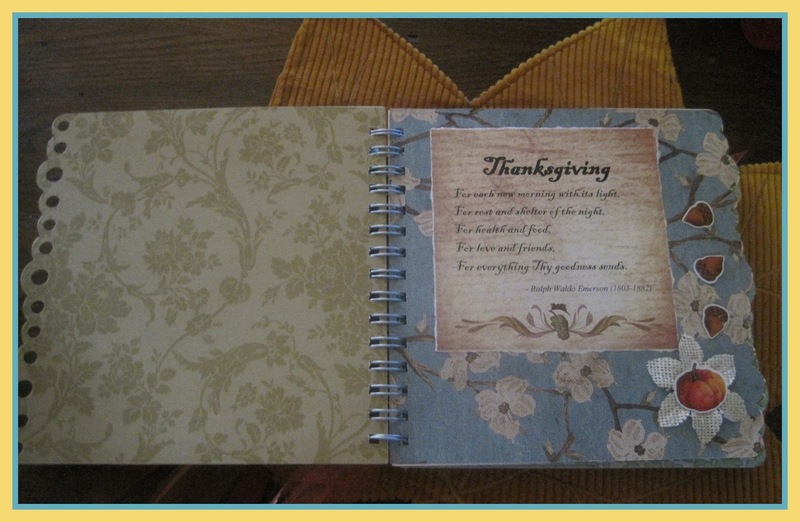 I used clipart for some of the content; cut some of it with Cricut and added all kinds of other embellishments. 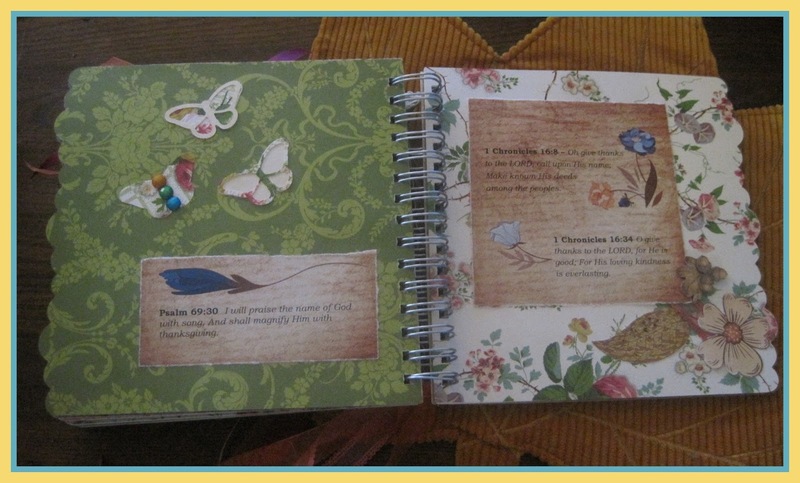 If you've seen my mini books before, you know I like depth and dimension in my books! 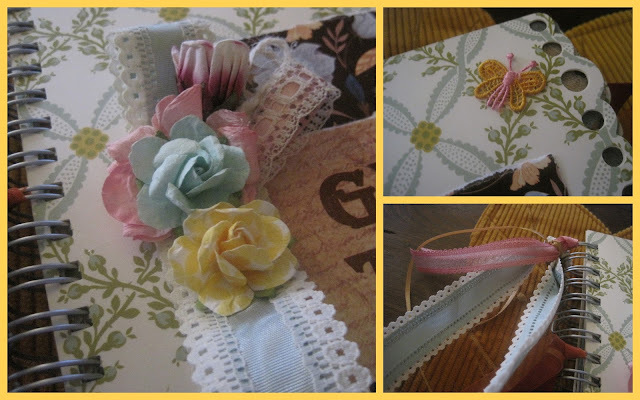 I used plenty of vintage ribbon and lace! 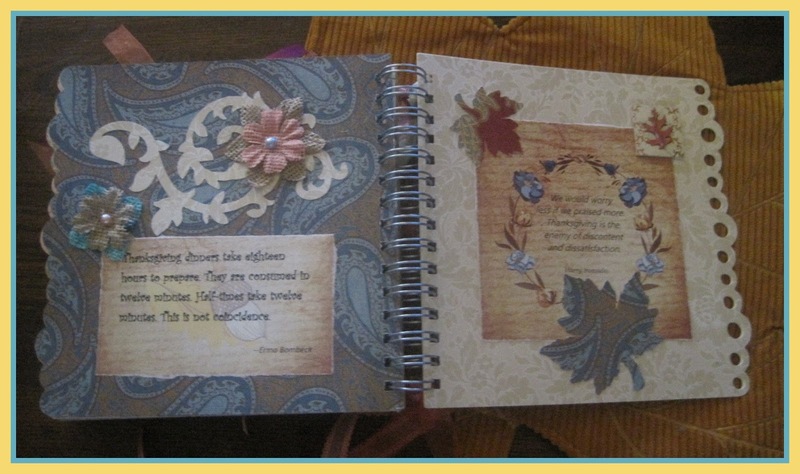 I cut the pages using the Elegant Edges patterns. 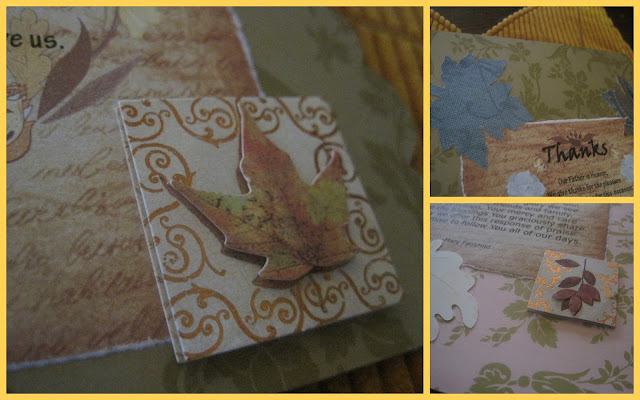 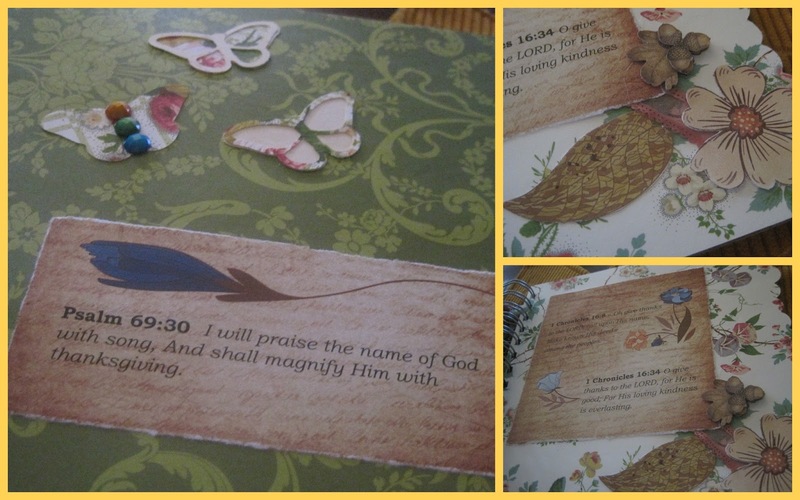 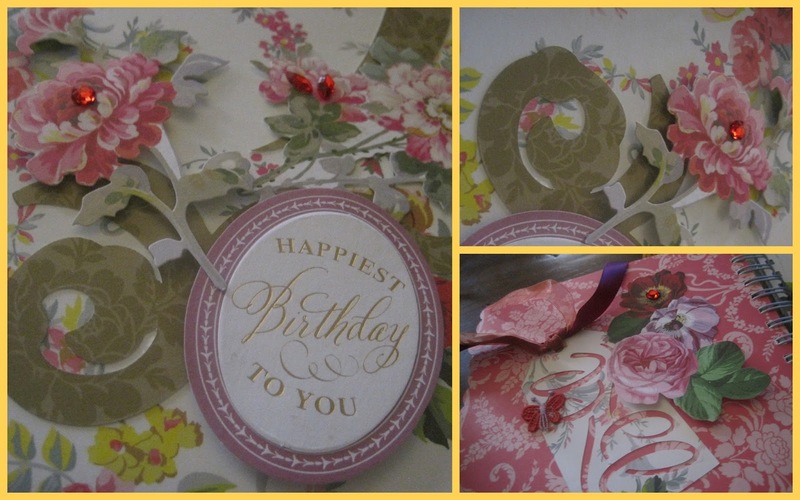 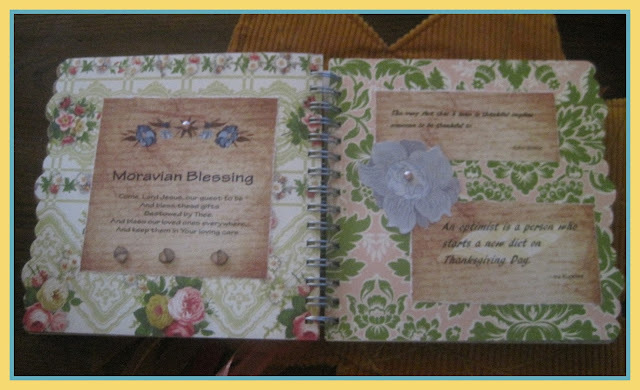 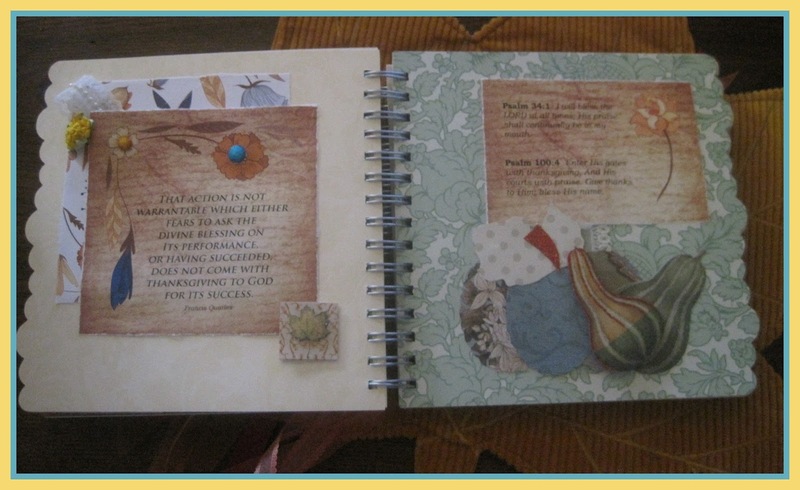 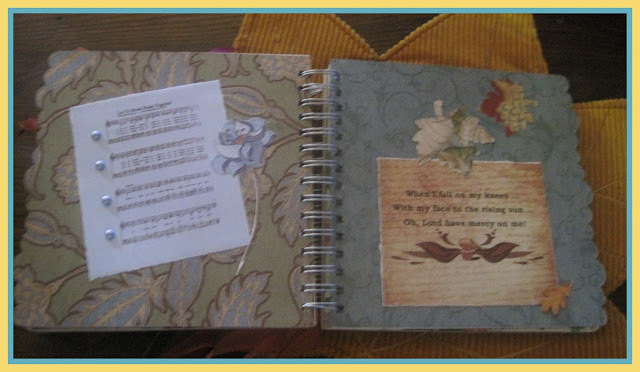 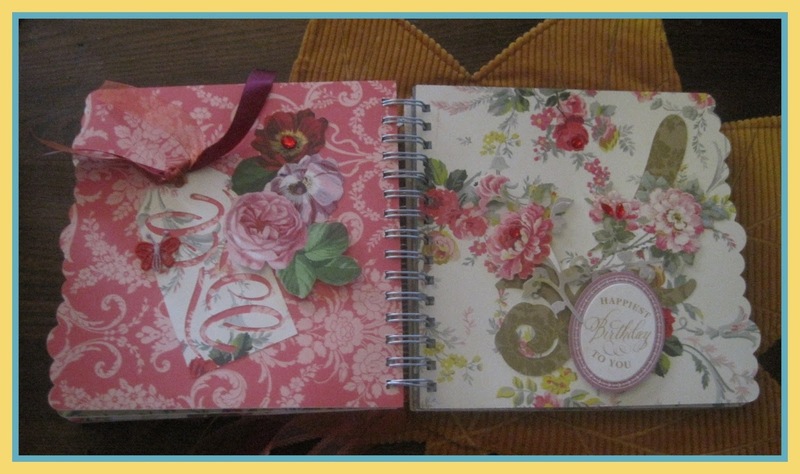 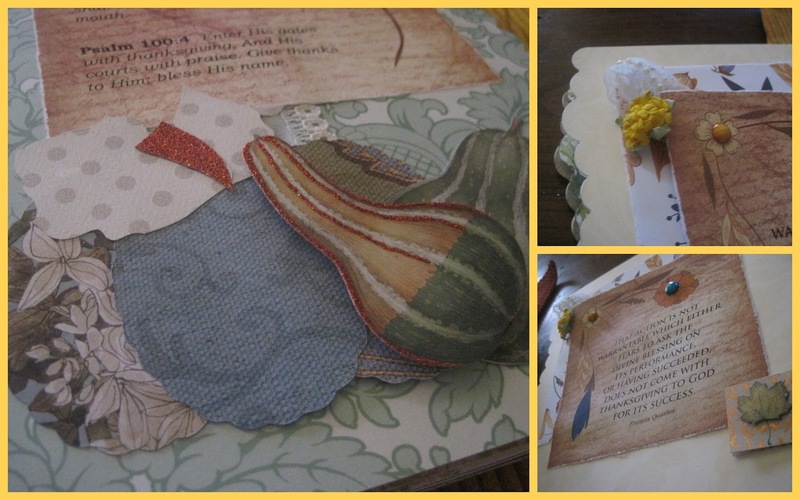 On these pages, I cut some pieces of the clipart ... an added some packaged embellishments. I love the burlap flowers! 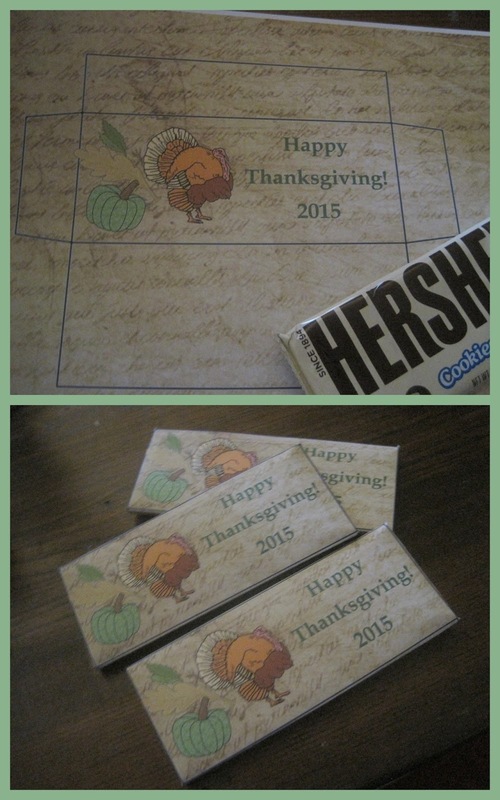 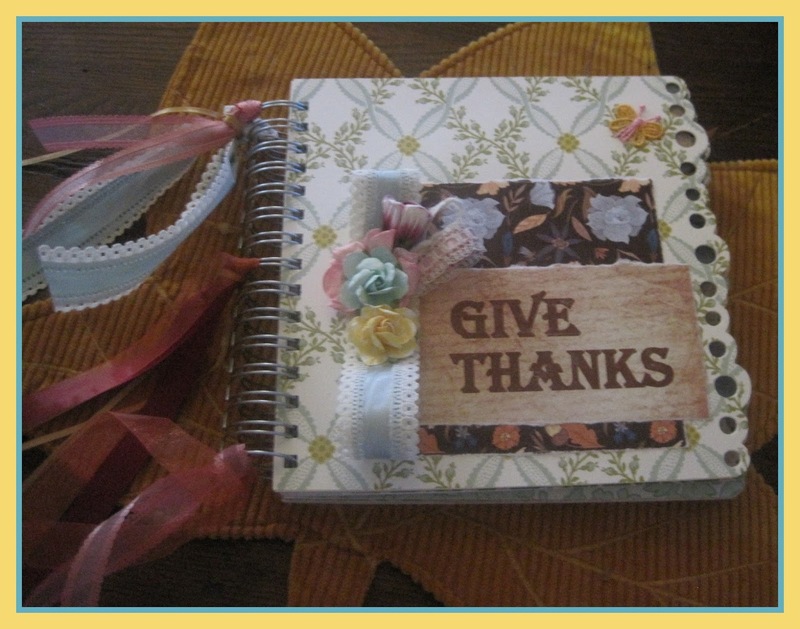 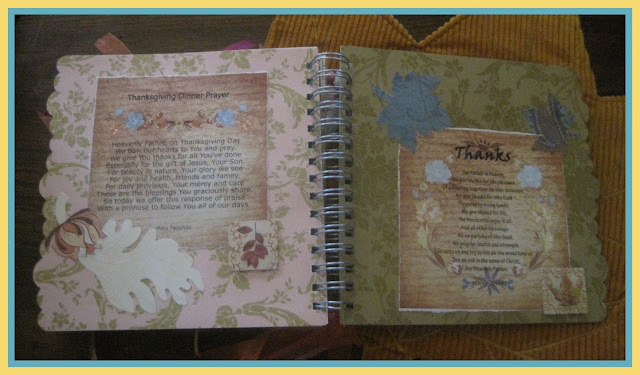 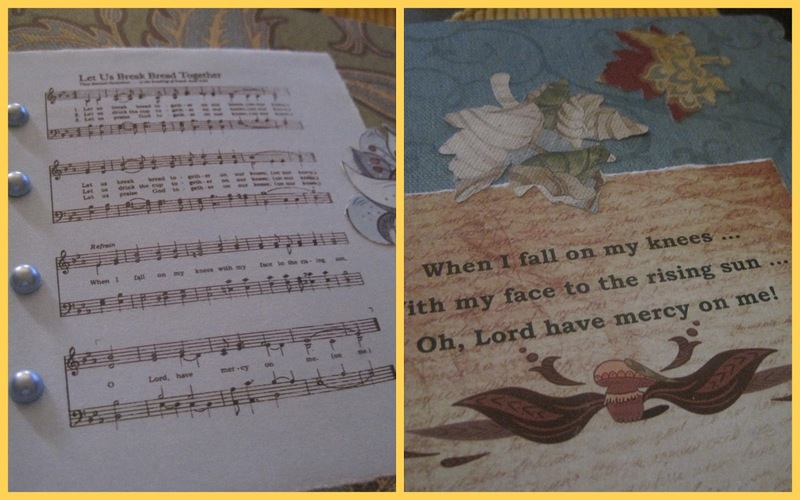 I used birthday greetings for the center pages and one of my favorite Thanksgiving songs on the next two pages! 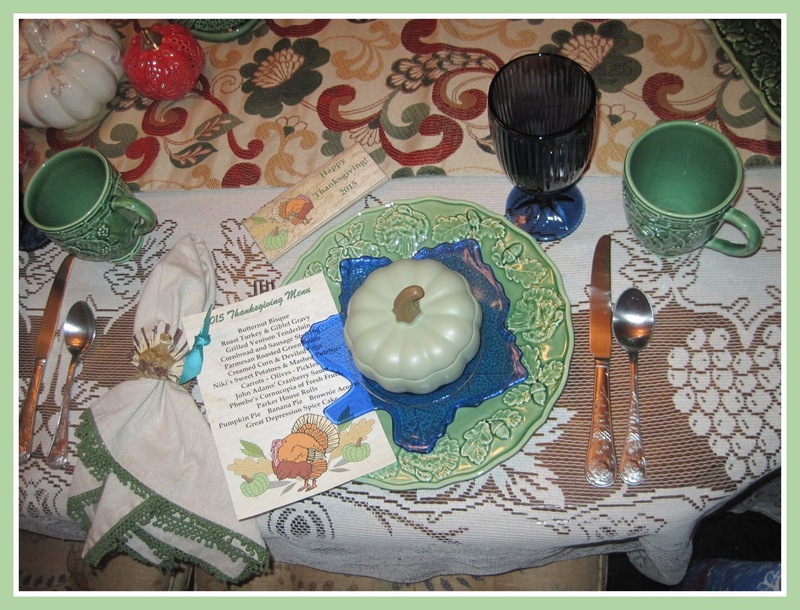 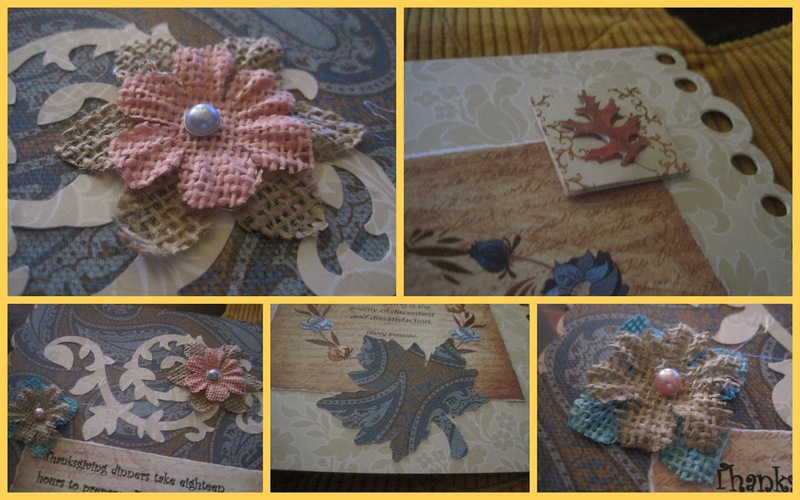 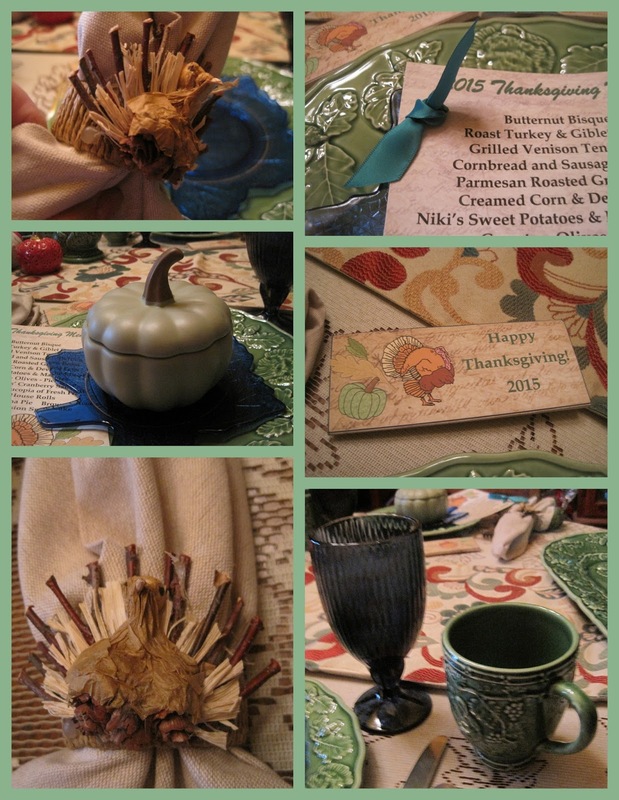 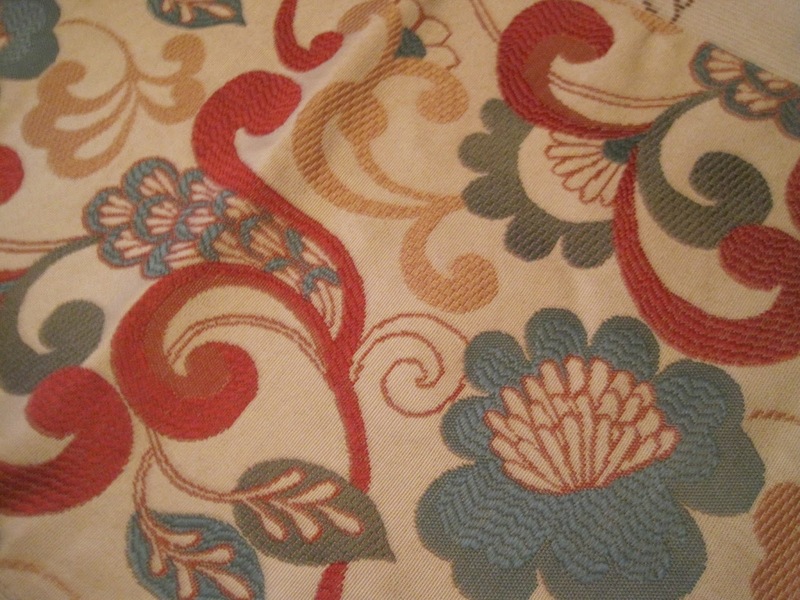 The final two pages are filled with layered burlap flowers, faux pearls and colorful leaves. 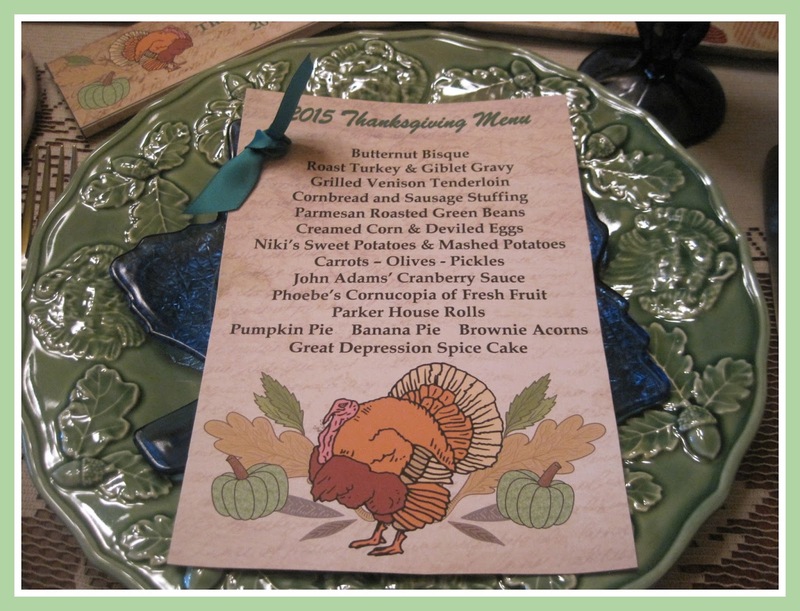 I'll be sharing this will a few of the parties listed on my sidebar! 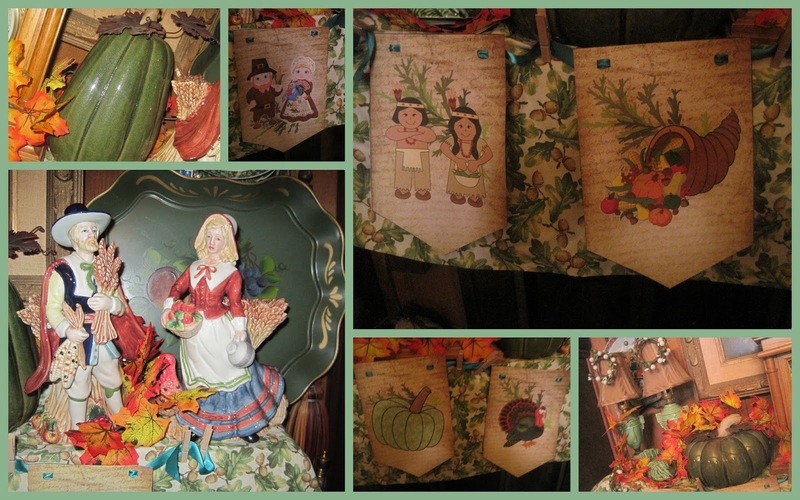 Make sure you click through to see the other participants ... and hang around my home page a little while to see my other posts! 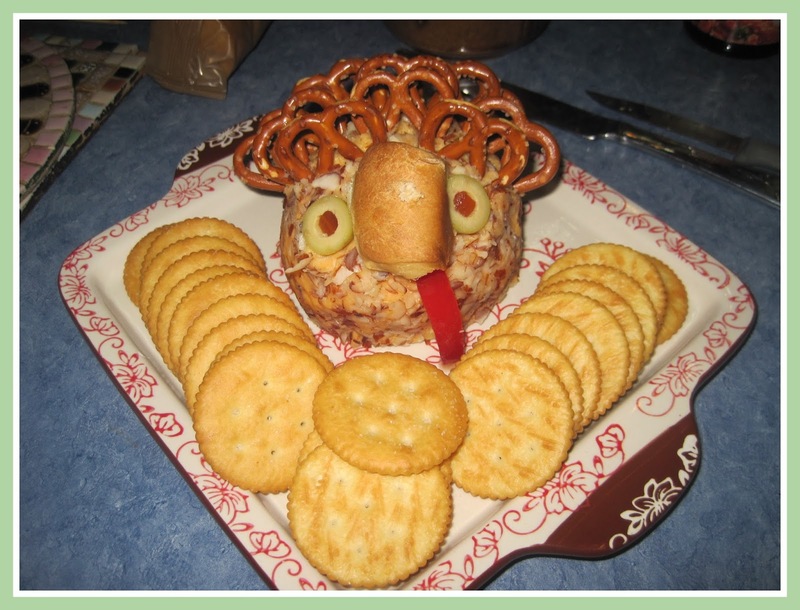 Happy Thanksgiving Week! Last Bouquet of the Season! 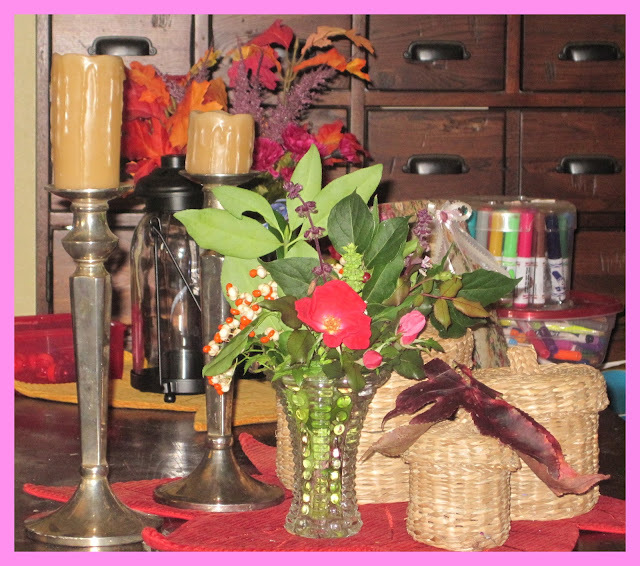 Here are our last flowers of the season! We've had a couple freezing nights, but some of my roses are sheltered a little bit, so I still had a few blooms today! 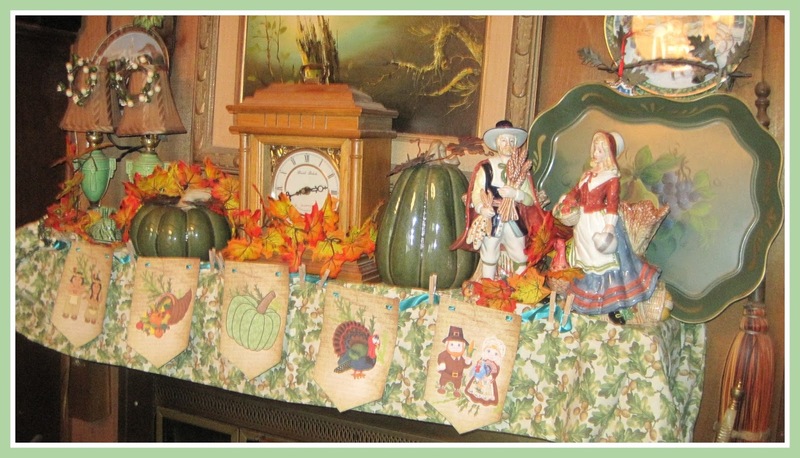 Phoebe's herb garden is still producing, too! 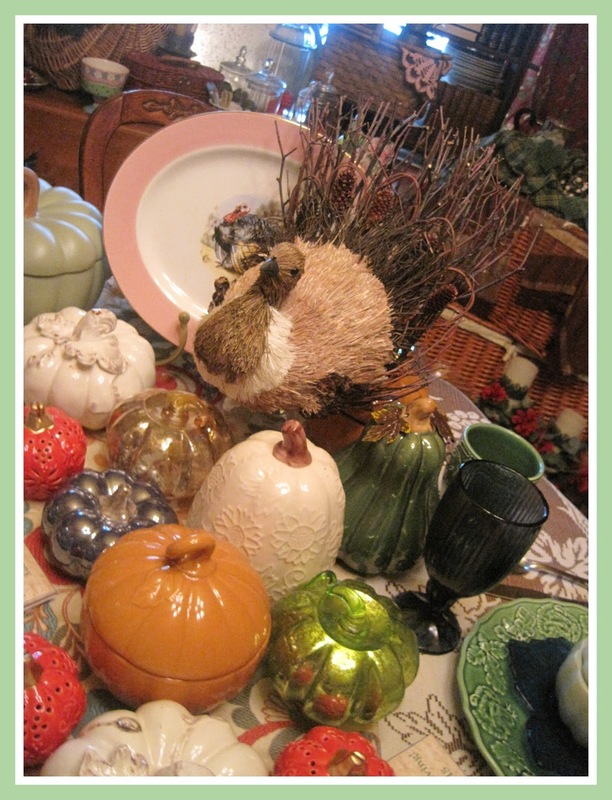 Beautiful leaves are falling from the Maple, Oak, Ash and Sweet Gum trees in my yard ... and our "bird feed shrubs" as my husband always called them ... add beautiful red and orange berries to the mix. The squirrels and chipmunks are really working hard gathering acorns, so I suspect we are headed for a bad winter and all those bird feed shrubs will be well used! 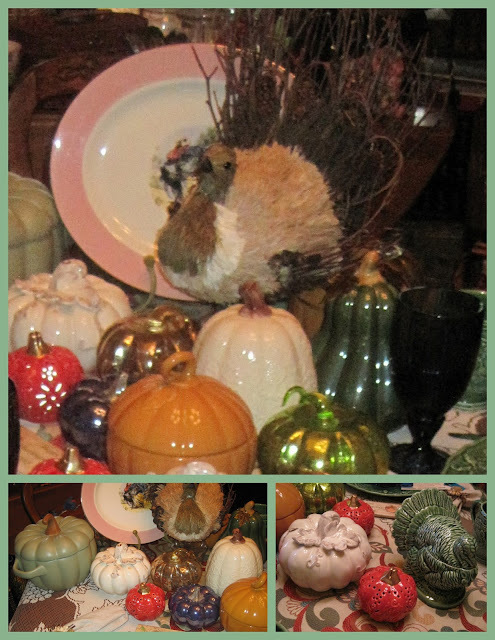 I love bringing a little of the outside inside! 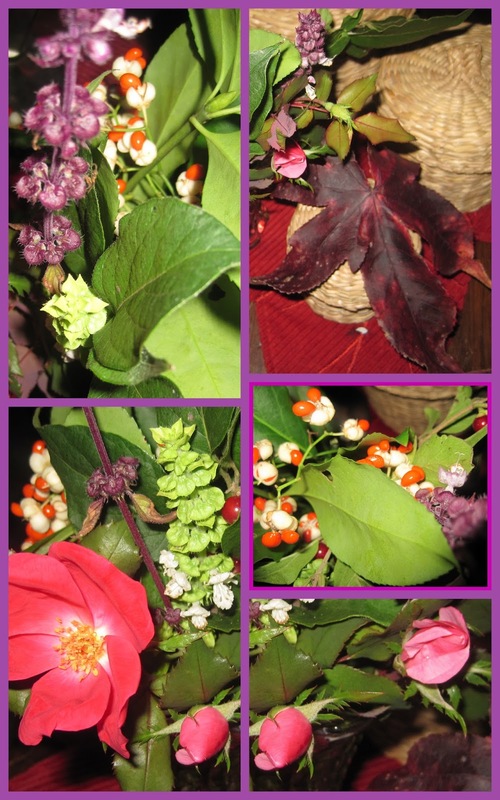 The purple and green flowers from the Basil plants add a nice scent to the boquet! These two precious tiny pink rosebuds will open overnight and remind me of the warm sunny days of June when they first start blooming! I'll still have these vibrant orange berries for a Thanksgiving tablescape! I'll be sharing this with some of the parties listed in my sidebar, so make sure you click through to see the other posts!